It is time to sign up for the 15th semi-annual Hot Water Grant Review Workshop at Fairmont Hot Springs! 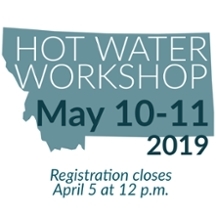 The Hot Water Grant Review Workshop will be held May 10-11, 2019. Type of submission: full draft proposal (new/re-submission/revision); specific aims/background; You are very welcome to register as a reviewer only, in which case we are grateful for your generosity in service to your colleagues! Title/Topic area of your proposal and be as specific as possible so that we can properly assign reviewers to your grant proposal. Efforts will be made to match reviewers and writers with similar expertise. However, this is only possible if participants provide a title by the 5th of April. Participants at the Hot Water Workshop reviews offer and receive supportive and critical feedback of each other’s grant proposals. The goal of this workshop is to provide valuable feedback to grant writers, to improve their proposals just in time for the NIH R01/R21/R15 due dates in June and July. The venue is Fairmont Hot Springs Resort, over a two-day period. Faculty who do not have proposals to submit, but would be willing to provide critiques as a reviewer only are very welcome to attend.